Whether we are focusing on the present, past or future, if our perspective is off, we can turn a small incident into something monumental. We must have God be our focus, so things are in the correct perspective. Sometimes the life lessons we all need to learn are seen in children. Having kids is an adventure, to say the least. More times than not, they are the ones that end up teaching me. For example, our youngest son, Quintin, came in the other day from playing outside to say that he needed a band-aid. However, when he came over to show me, I could barely even see that there was a scratch. Quintin, on the other hand, could not see anything else, but the hurt. His focus was on the boo-boo and what I might be able to do to make it feel better. Later, that same day, our middle son, Ethan, was working on his math homework and having a difficult time. He just kept saying that he could not do it; it was simply too hard. When Ethan’s focus was on the entire problem, instead of looking at it one step at a time, he could not see that he was ever going to figure it out. His focus was on all the problems he had for homework and not simply taking one step at a time. It is easy in these situations, as a mom, to step back and say, “Boys, this is not really as big of a deal as you are making it.” In these instances, they needed me to help give them perspective on the situation. It reminds me of a pebble. If we hold it up close to our eye, it is all that we see. However, if we hold it out farther. We can examine it and even classify it. To take it one step farther, if you would throw that same pebble at your feet, then it is seen in its true setting. It becomes just one tiny bump along our journey, instead of being the only thing we can see. For the longest time, I had a real issue with pain from my past. No matter what the Bible said, I was so focused on my pain, my hurt and my past that I couldn’t see anything else. I couldn’t imagine ever getting beyond this point. In fact, I became so focused on this one circumstance in my life that I was missing out on everything around me. I was turning this pebble into Mount Everest. In fact, I was beginning to be crushed under the weight of my past, feeling like I could not more forward and certainly could not be used by God. God began to work in and through my life to see that in His eyes sin is sin and Christ died on the cross for all of it. It was the enemy who wanted to keep me trapped in the past – distracted, discouraged and defeated. God lifted me up to see that I was loved, valued, important and needed. The very same thing is true of you dear friend. Don’t let the world lead you to believe anything different. God lovingly created each and every one of you for His purpose and plan. Therefore, when the past comes to haunt us, it is so easy, just like with the pebble, to be solely focused on the circumstance. Like my sons, who were consumed with their problems, we cannot begin to see anything else. It was all they could see and think about. When this happens, life’s circumstances begin to overwhelm us. 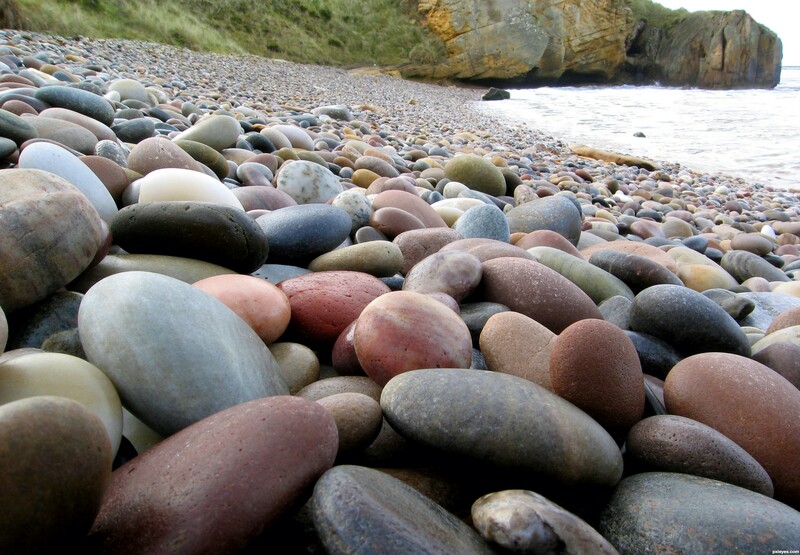 However, just like the pebble, we need to throw all of our troubles at our feet. The distance helps to put things back into perspective. God is right there, just like I was for my boys, to help us see things clearer. We simply need to take the focus off of the circumstance and throw it at God’s feet and let Him help us. It is mentioned in First Peter 5:7, “casting all your care upon Him, for He cares for you” (NKJV). God cares for us and wants to, not only help us, but to also put things into perspective. If you are feeling overwhelmed by a situation in your life or pain from the past, take a moment to give it all to God and let Him take care of it all. How is your perspective today? Are you looking at your circumstances or your Savior? Beautiful! Loved this post and the pebble analogy. Spot on! Working on perspective this morning and throwing those pebbles long and far at His feet! Amen! Love this! I have turned more than one pebble into Mt. Everest. Sometimes it takes a while to get that perspective but it always comes. Time frequently shows us the purpose for events in our lives and stepping back always helps give a new and clear perspective. Thank you for sharing this. It was truly food for thought this morning! Yes! It’s all about perspective. Love it! Thanks for this analogy Jamy. The pebbles in my past have seemed like mountains. It is a matter of prospective isn’t it?! Love you my dear sister in Christ. Love this Jamy! It’s awesome how our Father uses our kids to open our eyes to the lessons He has for us. Thanks for your reminder on perspective today. Thank you for sharing your story, This message really stuck out to me. I was injured in a job in 2007 from a patent that was over medicated. and am still fighting through the healing process. Thank you for sharing this very important message to get a bwtter understanding and how to move forward I am encouraged how you said, “We simply need to take the focus off of the circumstance and throw it at God’s feet and let Him help us. It is mentioned in First Peter 5:7, “casting all your care upon Him, for He cares for you” (NKJV). God cares for us and wants to, not only help us, but to also put things into perspective. If you are feeling overwhelmed by a situation in your life or pain from the past, take a moment to give it all to God and let Him take care of it all. Gave me a new hope, new understanding, a new way to #moveforward. Great word picture! Really helps me to see the bigger picture! 🙂 Really well written post.